Honor is FREE to attend but requires each attendee to register prior to the event. The Wilkes-Barre Connect Honor series will hold its first event on Wednesday, May 8th, from 8 AM - 4:30 PM, in partnership with the Small Business Administration, Northeastern Pennsylvania Alliance, the Small Business Development Center at Wilkes University, and NEPA Alliance PTAC. 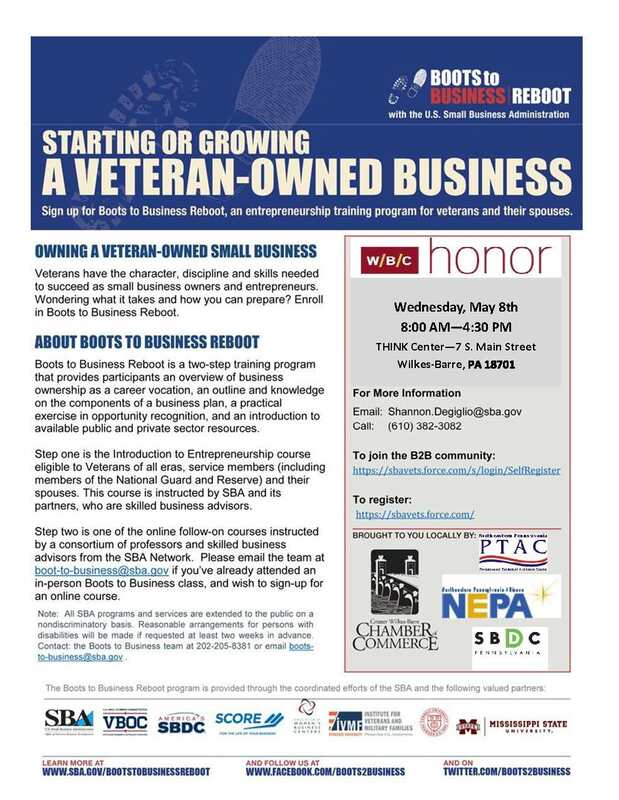 The SBA Boots to Business Reboot invites veterans and spouses of veterans to this day-long program, which will run from 8:00 AM - 4:30 PM, featuring speakers from the SBDC, Northeastern Pennsylvania Alliance, NEPA Alliance PTAC, SCORE, Brian P. Stahl, Esquire, Partner, Hourigan, Kluger & Quinn, P.C, NEPA, USDA, and MetroAction, Rosenn Jenkins & Greenwald LLP, CareerLink and more. The Honor program provides specific trainings and seminars for veterans in order to afford them the opportunity to access the resources they need to successfully grow a business. Honor is a Wilkes-Barre Connect program coordinated by the Allan P. Kirby Center for Free Enterprise and Entrepreneurship. Wilkes-Barre Connect is an initiative powered by the Greater Wilkes-Barre Chamber, that helps businesses grow in Northeastern Pennsylvania, featuring a partnership among the Small Business Development Center at Wilkes University, the Diamond City Partnership, the Institute for Public Policy & Economic Development, Ben Franklin Technology Partners of Northeastern Pennsylvania, the Family Business Alliance at Wilkes University, and the Allan P. Kirby Center for Free Enterprise and Entrepreneurship at Wilkes University. Wilkes-Barre Connect is housed in Wilkes-Barre?s THINK Center, a space made possible by the Penn State Wilkes-Barre and the Invent Penn State initiative.